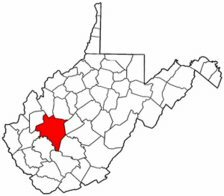 Kanawha County was formed in 1788 from Greenbrier and Montgomery counties. It was named for the Conoys, an Indian tribe that once lived in the area. The first spelling of the county was "Kenhawa", but later it was changed to "Kanawha". In 1800 part of Kanawha was added to Wood County. In 1804, 1809, and 1818, respectively, Mason, Cabell, and Nicholas counties were created wholly from Kanawha lands. Logan County was partly created from Kanawha territory in 1824, and that same year a small tract was added to Nicholas County upon resurveying of the boundary. In 1830 Kanawha gave up land to form part of Logan County, and in 1831 Fayette and Jackson counties were established in part from Kanawha. 1839 witnessed a small parcel returning to Kanawha from Fayette, but additional Kanawha territory was cut off to form Gilmer County (1845, Boone County (1847), and Putnam County (1848). In 1850 small parcels were added to Putnam and Fayette from Kanawha. Survey of the Clay-Kanawha line in 1858 removed additional territory from Kanawha; in 1867 Lincoln County was cut off from Kanawha, and finally, in 1868 the last dismembering of the county occurred when additional Kanawha land was added to Lincoln County. John Vogt, 2008, xii, 18 pp., 8x10 format, illustrations, maps, full name index. A faithful and accurate transcription of the first surviving census for this western Virginia county from which all or part of nineteen counties ultimately were formed. Kanawha Co. 1815 Directory of Landowners by Roger G. Ward. 2005. 25 pages, map, 5 1/2X8 1/2.